A University of Toledo researcher who saw his grandfather battle Alzheimer’s disease is hoping to find better treatment options with the help of a new research grant. 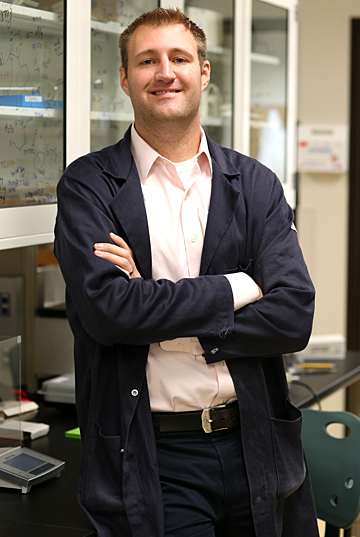 Dr. Isaac Schiefer, recently appointed assistant professor in the Department of Medicinal and Biological Chemistry, has received a $100,000 New Investigator Research Grant through the Alzheimer’s Association. Schiefer will walk in his grandpa’s honor at the Walk to End Alzheimer’s Sunday, Oct. 18, on UT’s Main Campus. The walk will start at the Health Education Center with registration and check-in at 9:30 a.m., a ceremony at 11:30 a.m., and the walk at noon. For more information on the event, click here. Schiefer, a synthetic bioanalytical chemist, developed a prototype molecule, which improves memory in mice, using a $10,000 grant he received last year from the American Association of Colleges of Pharmacy. His newest grant will allow him to further study the drug characteristics of the prototype molecule. Schiefer said the molecule was designed to increase brain-derived neurotrophic factor, also known as BDNF. BDNF, a protein, is important for long-term memory, and patients with Alzheimer’s disease have been shown to have less of it. Schiefer said BDNF’s ability to heal damaged brain cells could be compared to how Human Growth Hormone, known as HGH, helps athletes recover from muscle fatigue or injury. The molecule is the first step toward a drug that could be given to Alzheimer’s patients. “My lab designs the drugs, makes the drugs, and then we test to see if they work,” Schiefer said. “A key component of my research is making a drug that can be manufactured quickly and cheaply. This entry was posted on Friday, October 16th, 2015 at 3:34 am and is filed under Medicine and Life Sciences, News, Research, UToday .